Charles Carrington, Earl of Ransford is the very epitome of a devilish rake and he has no desire to change it. However, taking up the reigns of his family’s estate brings his grand plans of debauching the whole of London to an abrupt halt. Charles can only imagine the boredom he will experience, living in rural Ireland and being disgustingly respectable. Charles has no idea why, but his reaction to the mysterious Miss Julia Channing is more powerful than any attraction he’s ever experienced. And he’s experienced a lot. She is his opposite in every way; good where he is bad, soft where he is hard and determined to be kind to everyone, which is definitely is not. But Julia is not all she seems and as their attraction grows, so too does Charles’s certainty that all is not what it seems with the beautiful companion. Will Charles be able to solve the mystery of Miss Channing? And in doing so, will he find the happily ever after he didn’t even know he wanted? I always enjoy a good historical romance and The Ranford series is among my favorites. Even though this is the third in the series, it can easily be read as a stand alone. 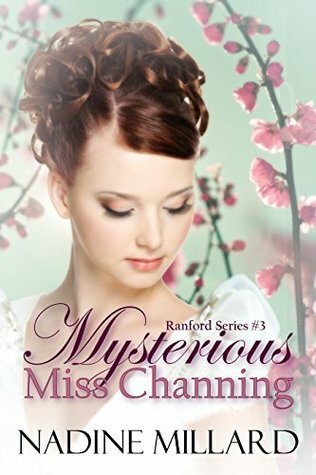 The previous two books tell the stories of Rebecca and Julia Ranford while this one tells the story of their brother, Charles, and how he falls for the Mysterious Miss Channing. Charles and Julia are a delight to get to know. He truly is a rake, but somehow Julia has caught his eye and though he'd say it's impossible, she has found a way into his heart as well. Both are beautifully flawed, which makes them absolutely perfect. The mystery surrounding Julia's past provides a necessary element of suspense and conflict for our two lovebirds. The introduction of Mr. Trent into the mix added comic relief that I know must have left the ladies Hartridge and Ranford in a fit of giggles when no one was looking. Rebecca and Caroline were a delight as always. They're wonderfully strong, independent women who manage to balance propriety and scandal while walking a knife's edge. While Julia prefers to stay more in the background, she's a product of her past and yet manages to hold her own and fit right in with these two ladies. Likewise Tom, Edward, and Charles are a fearsome trio that are also completely besotted by their women. I absolutely love the somewhat ironic combination - fierce protector and lovesick fool. The road to love is never straight, nor is is easy, and for Julia and Charles it definitely has it's twists and turns along with its ups and downs. If it weren't for work and family duties that required my attention, I certainly would have read this in one sitting. I hated having to put it down.